Recently, the Hog Roast Dundee team were hired by the University of Dundee for one of their events. 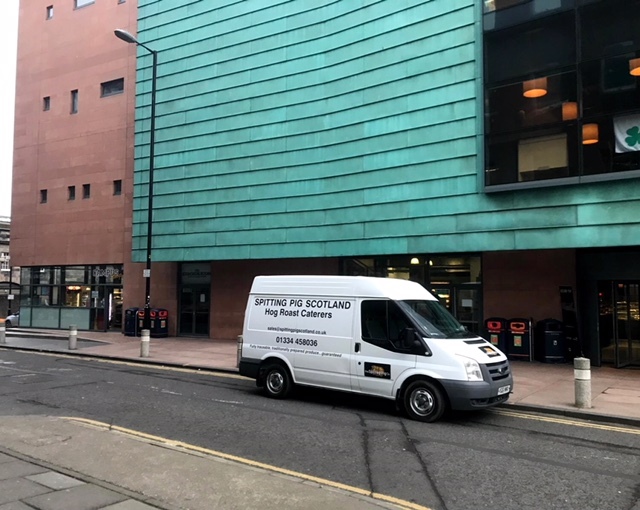 The event was booked by Jamie and hosted at the Abertay Students Association in the university’s Kydd Building at the university. Jamie did a fantastic job of organising the event and brought everyone together. This event perfectly demonstrated how successful the Hog Roast Dundee team are when catering for large numbers of guests. No matter how big or small your event is, the team will be able to cook enough food to please all of your guests. In addition, the team will ensure that they sustain the quality of food for all of their guests and uphold the high standards that the Hog Roast Dundee team has worked hard to maintain. Jamie selected Menu One from the Hog Roast Dundee team menu selection. This menu was a classic hog roast which showcased a whole slow roasted pig as the centrepiece for the buffet table. The freshly cooked meat was served alongside homemade apple sauce and hot stuffing as well as crispy crackling. Fresh bread rolls and wraps were also served in wicker baskets along the table as well as a selection of delicious sauces. The buffet was served to 350 people so it was vital that the Hog Roast Dundee team made enough food to serve to all of the guests at the event. The service was led by the Hog Roast Dundee team’s Head Chefs Steven and John who did a fantastic job of managing the service. They ensured that all of the food was perfectly cooked so that the guests could find no faults with the food. In addition, all of the food was crafted using locally sourced ingredients so that food tasted fantastically fresh. Furthermore, this also supports local businesses and help the Hog Roast Dundee team to help support the local community. The Hog Roast team received some fantastic feedback from the guests and were really happy with how the buffet turned out. The team themselves delivered a great service and were really friendly with all of the guests. Hog Roast Oban – Torque and pork.